Most of the stars in our galaxy orbit galactic center at a fairly moderate pace. Our Sun, for example, strolls along at about 220 km/s, or a bit under 500,000 mph. That might sound fast, but it isn’t nearly fast enough to escape the gravity of our galaxy. Instead it simply orbits the galaxy once every 240 million years. There are stars with enough speed to escape the Milky Way’s gravity. Either due to a close encounter with another star, or perhaps a flyby of a black hole, the star gains enough speed to escape the Milky Way. It is a process known as evaporation. Astronomers have searched for these hypervelocity stars, but most of the efforts have focused on looking for high radial velocities. Radial velocity is the motion of a star toward or away from us, and can be determined by the Doppler shift of starlight. Measuring radial velocity is fairly straightforward, but to have a high radial velocity the hypervelocity star would need to be moving in the general direction of our line of sight, which isn’t very likely. In general, a star’s motion can be determine by its radial velocity and what is known as proper motion. Proper motion is the apparent motion of a star across the sky, and it is much more difficult to measure. But a new paper in the Astrophysical Journal (arxiv version) has looked at the radial and proper motion of stars, and has found 20 candidate hypervelocity stars. Some of these have speeds approaching 600 km/s (1.3 million mph), which is much higher than the speeds necessary to escape the galaxy. What’s particularly interesting about these stars is that they are not the type of star you would expect to be a hypervelocity star. To get this kind of speed you need some mechanism to transfer a great deal of energy to the star’s motion. One way this can happen is for a binary pair to come close to the supermassive black hole in the center of our galaxy. During a close approach, one member of a binary can gain speed by at the cost of its companion. The companion gets captured by the black hole, while the other star gains tremendous speed. But this type of star would be speeding away from the center of our galaxy, and these are not. They also are Sun-like, rather than the bright blue stars that occupy the central region of our galaxy. There is another possibility, and that is that the measurement of the proper motions of these stars are not as large as they appear. 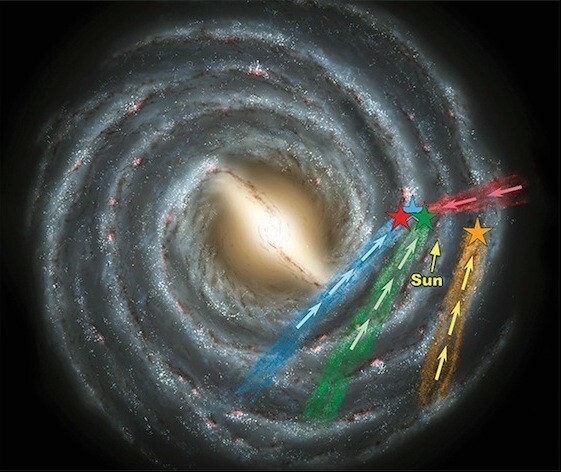 They’ve only been observed for a short time, so its possible that the stars are moving more slowly than they appear. The authors of the paper did some statistical analysis to show that these results are likely correct, but further observations will nail their speeds down even more. So it seems we have an interesting mystery. How did some of these Sun-like stars get such tremendous speeds? At this point, we’re not really sure. Paper: Palladino LE, Schlesinger KJ, Holley-Bockelmann K, et al. HYPERVELOCITY STAR CANDIDATES IN THE SEGUE G AND K DWARF SAMPLE. ApJ. 2014;780(1):7-.